Although widely regarded as the most English of drinks, tea was actually something of a latecomer to these shores. While it’s been drunk in China since 3000BC (give or take a few years), it didn’t arrive here until the middle of the 17th century. About time too! The East India Company really began to capitalise on the growing demand for tea in the mid-18th century. Until the early 20th century, tea leaves were brewed in a pot, retro-stylee. That all changed in 1908, when the teabag was accidentally invented (qv. The microwave oven, post-it note and Teflon) by New York-based tea and coffee importer Thomas Sullivan. He would send his customers samples of tea packed in small silk pouches. The loose tea was intended to be removed from the bag, but many of his customers found it easier to brew the leaves within the porous silk bags. 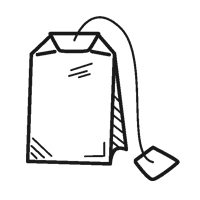 Ta da…The teabag! For years, teabags were made of silk, then gauze, and remained in the format of an envelope or pouch. 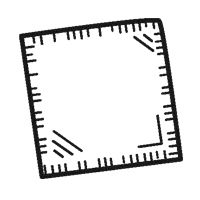 However, in the 1940s, the rectangular, heat-sealed, paper teabag came on the scene, and was introduced to the UK in 1953. It thus became a genuinely convenient alternative to loose leaves, although the compromise was that much of the quality of the leaves themselves were lost as they were processed to the powdery stuff still found in most round or square teabags today. Then came the tagged teabag; no need for a spoon to remove the bag from the water, so a bit of a step forward, but still no real advance on the quality of the tea leaves within the bags; great quality tea was still only available loose. 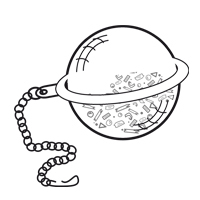 As customers demanded more from their tea, it became clear that a better solution was needed, and thus the mesh metal tea infuser ball was born. No need for a teapot, just load up the infuser ball with lovely whole leaves, leave them in your mug for a few minutes and there you have it; a lovely brew for one, with no teapot to empty out and wash up. The downside? There’s now a mesh tea infuser ball to empty out and wash up. 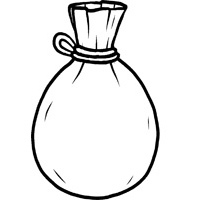 So that wasn’t the solution, and the infuser ball soon faded out with the advent of the pyramid bag in the 1990s. This offered a much cleaner no-mess alternative to brewing whole leaf tea in a teabag. All the flavour, none of the fuss. 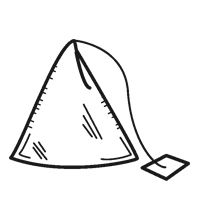 There’s science behind it too; the Advertising Standards Authority ruled that pyramid-shaped bags are more effective than the more traditional flat, round tea bags when making a cup of tea. 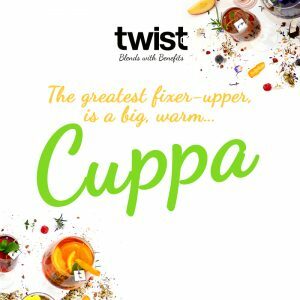 And now, in 2017, comes Twist Tea. Top quality teas, in a convenient format – but offering so much more. Of course, they are great as a hot drink. But, they have a range of other functional benefits that give customers even more bang for their buck (or should that be ‘brew for their bag’?) Some are delicious served over ice, others taste great brewed in milk, or served with tonic water… Some have added functional herbs to wake you up in the morning, energise you after lunch, or help you off to sleep at bedtime. 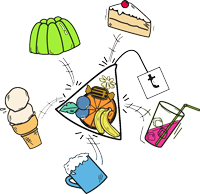 Click here to see our Classic Teas, Cold Brews and Puds Without Sin ranges. The summer of sports has well and truly begun – bringing with it a renewed interest in everything sports related. How do the best of the best do it? What helps them achieve the perfect physical fitness in training to be victorious? In a recent article in the Telegraph, it would appear the English football team has the answer: drinking tea! The tea in question is yerba maté, a traditional South American drink, made from the leaves and twigs of the IIex paraguariensis plant. Maté provides the energy boost without the jitteriness of coffee and has become very popular with top cyclists like Tim Wiggins. Naturally, we’re big fans of maté, which is why we’ve added yerba maté to our Breakfast Boost blend. It compliments the full-bodied blend of Assam and Ceylon, with added ginseng, making it the ideal brew to get you up and going. Whether you train for the World Cup, a marathon, dance classes or just fancy a cuppa, here are 5 functional health benefits of drinking maté. 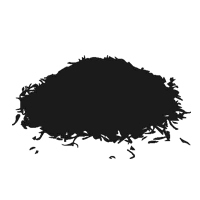 Maté contains polyphenols and saponins, naturally occurring plant compounds. These have antioxidant and anti-inflammatory qualities, providing help during recovery stage – so you can get back on the playing field sooner! Compared to the other most commonly used sports stimulants – coffee, kola, cocoa, guarana – yerba maté provides the most balanced energy boost. Users have reported a smooth and clean energy boost, experiencing a state of high alertness similar to coffee but without the side effects of jitteriness or a sudden energy crash. Current research has shown that drinking maté before exercising may improve muscle contraction, reduce fatigue and help with burning fat for energy, improving sports performance. Maté contains the amino acid called L-theanine which helps with focus and attention. It also contains a moderate amount of caffeine. The effects of caffeine as a psychoactive stimulant are widely known, enhancing memory, mood and alertness. In maté, the caffeine combines with theobromine and theophylline – providing an additional level of nutrition to enhance creativity and productivity. To add to the list of benefits it also exhibits more antioxidant power than any other tea-based drink. If you’d also like to take advantage of these and many more health benefits, we have Breakfast Boost on its own or as part of our selection boxes. Or Pick & Mix to create your ultimate tea collection. 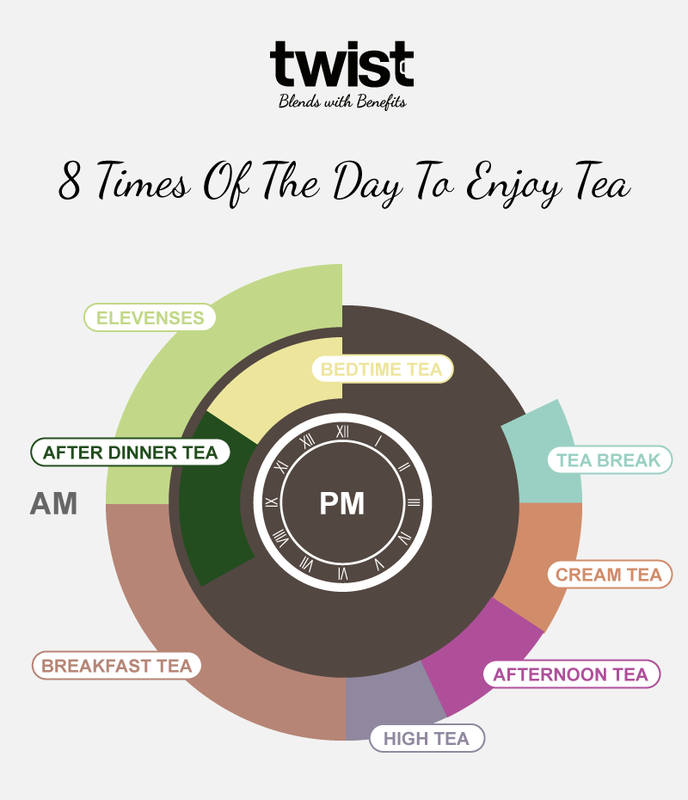 With over 150 million cups of tea drunk in Britain daily, you might be surprised to learn there isn’t a simple one set time for tea. We’ve taken up a Herculean task of untangling the various moments when one can enjoy a cuppa into a loose-defined 8 times for tea in a day. Read on for a small insight into a tradition that is considered an inseparable part of British cultural heritage. 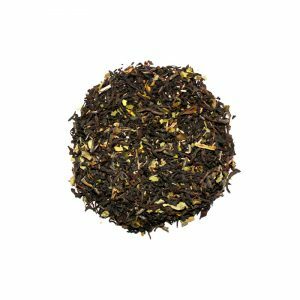 The tea to start your day with – English breakfast tea is often a blend of Assam, Ceylon and Kenyan black teas although the blends vary. The practice of drinking tea for breakfast has – somewhat surprisingly – originated in America in the 1840s, as coined by tea merchant Mr Richard Davies who was the first to use the base of Congou (black Chinese Tea) with the addition of Pekoe (black Sri Lankan tea) and Pouchong (light Oolong variety) in his favourite time for tea. The blend was then carried back to the UK by the Scottish merchants and popularised in England thanks to Queen Victoria who acquired the taste for it at her holiday home of Balmoral, Scotland. In Ireland, the blend tends to be stronger, thanks to higher Assam content and is enjoyed with plenty of milk, often accompanied with an offering of breakfast treats. 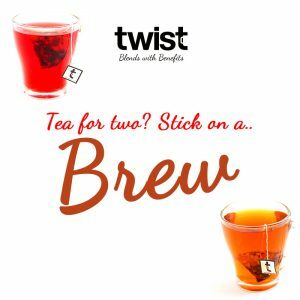 Want to try the breakfast tea Twist Tea style? We love Breakfast Boost with its blend of finest Indian Assam black tea and Sri Lankan black tea with added functional benefit of yerba mate and Siberian ginseng. Thanks to the inclusion of the ginseng, you won’t get any jitteriness but at the same time plenty of energy from this wonderful blend. Made popular recently by hobbits in Lord of the Rings and Hobbit franchises, elevenses refers to a time for tea and a light snack taken at eleven in the morning. More than a snack itself, tea (such as Refresher Green) forms an essential part of this brief pause in the whirl of a day, providing a moment of calm and peace. The whole sencha green leaves in our green tea have none of the bitter aftertaste caused by smaller cut leaves and naturally extend the feeling of relaxation even after you’ve finished your cup. Elevenses is, in fact, a time for tea so important, the concept has traveled well to other parts of Europe and further out into the world. In Sweden, fika is a mid-morning break, taken with tea or coffee and a slice of cake or a pastry. Tea-drinking dates back to ancient China – the afternoon tea tradition is a rather recent invention by one Anna the seventh Dutchess of Bedford in the year 1840. Meal times in the 1800s have not been spaced out to her liking and thus she has asked for a tray of cake, bread, butter, jam and tea to be brought to her room for her time for tea, in the late afternoon. Earl of Sandwich had a similar idea of putting a filling between two slices and naturally, the fashion of taking an afternoon tea took the society by a storm from then on. If you’d like to start your own tradition, try Raspberry Choc Kiss – with pieces of cocoa, tart raspberries and fragrant rose petals, indulgent and delicious, yet with no sugar or sweeteners. 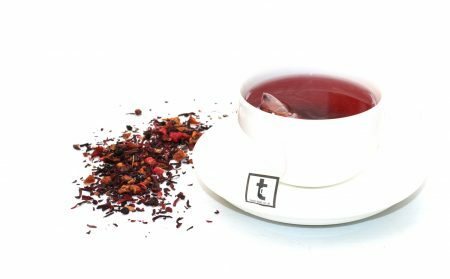 A blend full of exquisite natural ingredients, adding a luxury feel to any afternoon time for tea. According to a legend, the origins of cream tea can be traced to Tavistock Abbey in Devon. After being plundered and badly damaged by Vikings in the 11th century, the monks have fed the labourers restoring it a rich diet of strong tea served with a side of bread with clotted cream and strawberry preserve during their time for tea. The counties of Somerset, Cornwall and Sussex will all contest this origins story as they all claim the tradition started with them. Modern-day cream tea is often considered an institution with standard rules: the cream is always clotted, the jam (or preserve) better be strawberry and the scones must be freshly made. The pot of tea is hot and plentiful and additional cakes may be offered, such as Victoria Sponge. The great Cornwall – Devon debate is over the order in which you assemble your scones: cream then jam or the other way around? Whichever you prefer, cream tea is a wonderful summer tradition, found all across the West Country. For a delicious Twist Tea variation, try Afternoon Perks which delivers a light energy boost with its light-bodied blend of Ceylon and Darjeeling black teas, perfect for drinking all day, whenever you’d like a time for tea. After the industrial revolution, afternoon tea signified a social event for upper classes, while traditional high tea was a necessary time for tea and a full meal at the end of a day – to some extent this version is still popular in Scotland and parts of Northern England. The clever blend of Sri Lankan black tea with functional gingko biloba to boost mental performance and complemented by notes of bergamot and orange blossom, Earl Great goes well with any meal at high tea. The humble tea break is a firmly established time for tea in the British history, beginning in the 1780s during the height of the industrial expansion. The workers in factories often put in excruciatingly long hours and sustained themselves with strong sugary tea as a stimulant of choice. The tea was cheap, easy to prepare and suited a time for tea during the short breaks allowed. Such was the passion for tea breaks that in WWII, all British armoured vehicles have been equipped with a boiling vessel so that the team can enjoy a fresh cup of tea. Nowadays, office planners have to consider including a breakout area, for that all important time for tea – a cuppa to collect your thoughts and socialise with your colleagues. 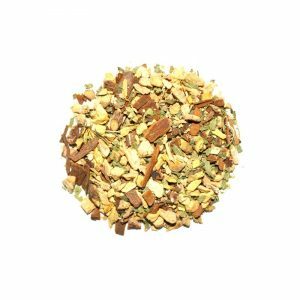 We like to chat over a cup of naughty-and-nice Mint Humbug, a caffeine-free blend of rooibos and mint, perfect for those moments when we crave a sweet treat. Full of natural ingredients, with no sugar or artificial sweeteners, this is the one pud we can’t get enough. In Spain, sobremesa is something to delight in and enjoy. While literal translation means ‘over the table’ the full definition is a bit longer. It’s a time after a meal, spent in conversation, socialising, relaxing and digesting. Often accompanied by further drinks, one can take pleasure in light herbal tea infusion, such as our After Eat blend with refreshing peppermint and delicious cocoa – you’ll give your digestion a helping hand whilst providing you with a satisfying ‘dessert’ option. All natural cocoa makes this blend sweet and satisfying without added sugar or sweeteners, perfect for the after-dinner time for tea. A good sleep is essential for our health. The studies have shown the importance of winding down after a day by practising simple evening rituals that will aid relaxation and contentment. One of these rituals is mindfully making time for tea – the preparation and enjoyment of a soothing cup of tea. 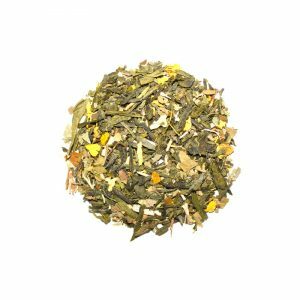 Whilst the green tea has been enjoying a bit of a spotlight thanks to the presence of L-theanine – that can help with focus and cognitive function- we are big fans of Chamomile Yawn, the soothing blend of whole chamomile heads, lemon balm, rose, lavender and valerian, the functional herbs proven to help you unwind and relax. Whether you take yours with biscuits, cakes, between breakfast and lunch or post-dinner, we have a tea to suit every time for tea, mood and moment. Furthermore, for a taste of something completely unique, get in touch and we will prepare a blend according to your requests. Did you know? There are around 3,000 types of tea, which is why it’s the most popular drink in the world, second to water. So you can imagine how many different words for tea there are in use today. 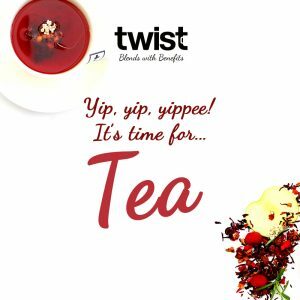 Here at Twist, we offer 24 “Blends With Benefits” so in the spirit of discovery, we decided to look at different words for tea and their origins. For each of the different words for tea, we’ve even created a pretty shareable quote so feel free to post them on your social channels using #TwistTeas. In the meantime, put on the kettle, grab a slice of cake or a biscuit and enjoy! Tea is one of the British cultural staples, as much as rain or red telephone boxes. The origins of the tea-drinking tradition date back to the Han dynasty emperors in ancient China in the 2nd century BC. China is also considered to have the earliest known records of the word for tea, te, dating back to the 8th century AD. Once a luxury for the upper classes, modern day tea can be enjoyed with or without milk, in the palaces or in your kitchen. To create the perfect tea, brew a cup of Breakfast Boost to get you up and running in the morning. The origins of chai hark back to ancient Persia and describe a drink flavoured by a sacred combination of bitter leaves, spices and honey. It was in India where chai really took off as a drink of choice on hot and cold days. Traditionally a family pot would always be ready with an individual recipe, producing a warm soothing cup, serving as a natural digestif and improving one’s day from the first sip. 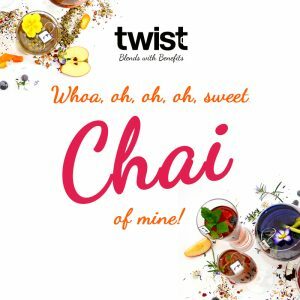 We have many delicious flavours but the one we keep coming back to is Sweet Chai of Mine. There isn’t much in the world that can’t be improved with a nice cuppa. First recorded in 1925, it almost always is followed by ‘tea’ unless you’re in the US where ‘cawfee’ or ‘joe’ is not unheard of. A cuppa gives just enough time to take a break and catch up on the recent happenings with a good friend. For a tea as versatile as the word it describes, we reach for Choffee Mint – tea, coffee, hot chocolate and mint, all in one cuppa. Spoken at one time all across the East-end of London, cockney rhyming slang was the language equivalent of a well-brewed cup of rosy lee – complex, full of character and completely unique. 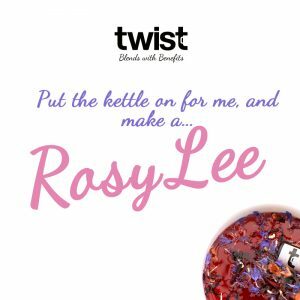 Amongst the different words for tea, the origins of this example of cockney rhyming slang aren’t quite clear however, we can confidently say it doesn’t derive from the name of the burlesque dancer Gypsy Rosy Lee. The expression, known in print since 1925, pre-dates her working life. ‘Say it with flowers’ some say – or you can say it with a lovely cup of our Passionfruit & Rose blend. Although Germanic in origin and dating back to the 500 BC, brewwana eventually made its way to England and over the centuries evolved into the word we all know and love. A good brew up is for those occasions when the family comes over, together with a cake or at least a tin of biscuits. Whilst the leaves are steeping in hot water, all matters can be discussed and the world put to rights. Be sure to have a caddy of Afternoon Perks next time the family visits, giving a nice lift to those afternoons. Unbelievably, the word for builders referring to tea was only first recorded in 1996! Although legend has it that it’s been in use conversationally for many years before that. Taking inspiration from the materials they work with, builders tea is characteristically very strong, with a dash of milk to make it more akin to a redbrick, sweetened to preference (often not at all!). The importance of a sturdy mug to hold it in cannot be underestimated, and our Twenty Four Seven is the perfect brew for the job. Hard hats are optional! So how did you like our words for tea? Did we miss any? Tell us your thoughts in the comments below. 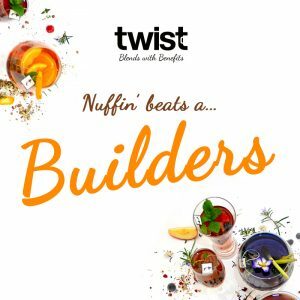 Whether you enjoy a cuppa or a good old-fashioned builders, here at Twist Teas, we’ve got a tea to suit every mood, time of the day or season. And if we don’t – we welcome all suggestions to create new and exciting blends!